How Does a Seat-of-the-Pants Writer Create Story Structure? What if you don’t like the Snowflake Method? Is there a way to structure your story if you prefer to write by the seat of your pants? I have been reading your book “How to Write a Novel Using the SnowFlake Method” and first I would like to thank you for writing a book that shows how to properly write a story instead of making book that shows me what a story is supposed to be. In my adventures as a writer I have found myself preferring the “fly by the seat of your pants” writing style, but I feel that more structure is needed. However I feel that the Snowflake method stifles the unconditional inspiration that comes with “fly by the seat of your pants” writing. If you can walk in my shoes for a bit, what would you do to structure your story without losing valuable inspiration? Your “story structure” defines the emotional journey that your reader takes when she reads the final draft of your novel. So your creative paradigm and your story structure are two very different things. You can have a good story structure for your novel, no matter what creative paradigm you use. But you’ll find your story structure at different points in the writing process, depending on what creative paradigm you go with. Writing by the seat of your pants. The Snowflake Method (this is the one that’s made me famous). It’s possible to write a well-structured novel using any of these creative paradigms. It’s also possible to write a terribly-structured novel using any of these creative paradigms. Writers who design their novel before they write it (Snowflakers and Outliners) are in theory supposed to be designing in a good story structure. That’s the main reason they design first. But if they don’t understand story structure, then they probably won’t design a good structure for their novel. Good story structure is explained in many books, including the one Steven mentioned, my best-selling book How to Write a Novel Using the Snowflake Method. This how-to book is written as a story, and it’s self-referential—the First Disaster in the story happens in the chapter that explains what a First Disaster is. The chapter on Proactive Scenes is written as a Proactive Scene and the chapter on Reactive Scenes is written as a Reactive Scene. The entire book is an illustration of itself. And of course I wrote the book using the Snowflake Method, and my Snowflake documents are included at the back of the book so you can see how it was done. But What About That Pesky Story Structure? Now we can answer Steven’s question. He recognizes that it’s possible to write a novel seat-of-the-pants and end up with good story structure. But his question is how to make that happen. First, note that your creative paradigm is just a method for getting your first draft down on paper. That’s all. I recommend that you use whatever creative paradigm works best for you. Your brain is wired a certain way, and you shouldn’t try to change your wiring. Second, you need to remember that your first draft is not your last draft. Only the last draft needs to have good story structure. Your first draft doesn’t. Your first draft is nothing more than a stepping-stone to your last draft. If you use the Snowflake Method correctly, then your first draft will have good story structure, because you designed in a sound structure from the get-go. But you’re still going to need to do revisions on your novel. You may need three or ten or a hundred more drafts to get your story the way you want it. During those extra drafts, your story structure may evolve, but it probably won’t change radically. Other things will change. That’s why you’re writing multiple drafts. If you write by the seat of your pants, it’s likely that your first draft won’t have good story structure. That’s okay, because that wasn’t your goal. Your goal was to get the first draft down on paper, and you achieved your goal. So it’s perfectly fine if your first draft has poor structure or no structure. The point is that it’s something, and you can work with something to make it better. You can’t work with nothing. So what do you do with a messy first draft? Well, you’ve got a lot of work ahead of you. First, read through the whole thing and make notes on any problems you see. Don’t fix the problems; just make a note of what they are. Make a list of all the scenes in your novel. You can do this on 3×5 cards or use a spreadsheet or my software Snowflake Pro or whatever tool you like. From that scene list, make a synopsis of about four pages that summarizes your story. One paragraph for each group of related scenes should do it. Create a “character bible” that spells out all the details about each character. Condense your long synopsis down to a one-page synopsis. Write up the backstories for your characters. Write a one-paragraph summary of your short synopsis that spells out the Three-Act Structure of your novel. Write a one-sentence summary of your story that captures its essence. You’ll note that the above analysis is sort of a reverse version of the Snowflake Method, where you are starting from a large document and reducing it down, bit by bit, to its essence. Along the way, you’re finding the structure of your story. When you’ve got your second draft done, update your analysis to make sure you’ve now got a sound story structure. (Remember, story structure is essential. It’s what gives your reader emotional satisfaction, and the main goal of writing fiction is to give your reader a powerful emotional experience.) If your story structure is still broken, fix it and then write another draft to get it right. Keep doing this until it’s good. Then you can go on to the next step in revision, which is to make sure all your scenes are working. Then you can polish the novel, and you’re done. Sounds like a lot of work? It is. I would be dishonest if I said that writing fiction is easy. Writing fiction is hard, and at some point you have to do the work of designing your story structure. Snowflakers and outliners do this work up front, before writing the first draft. Seat-of-the-pants writers and edit-as-you-go writers do this work on the back end, after writing the first draft. But everybody has to do the same work. It’s just a question of when you do it. In the end, the reader doesn’t care when you did the hard work. The reader just cares that you did the hard work. Is all that work worth it? That’s for you to decide. If you believe that reading a powerfully emotive story has value, then writing a powerfully emotive story must also have value. And that requires writing a story with a powerfully emotive design. I’ll say it once more, since this needs repeating. There is no “one right way to write a novel.” There is one right way for YOU to write your novel, based on the way your brain is wired. But the way that works best for you is not necessarily the same as the way that works best for your friend. Seat-of-the-pants writing works for some. So does edit-as-you-go. So does outlining. And of course, Snowflaking works for some. One of the things that makes me happiest in life is knowing that this simple process I created has helped many tens of thousands of writers around the world write their novels. Of course the Snowflake Method is not for everybody. But it’s for a lot of somebodies. And that’s kind of cool. What if you’re halfway through your novel and it just doesn’t feel convincing? Do you scrub the project? Keep wallowing on through the muck? How do you know what’s right? The trouble is, now I’m half way through my second draft, and I believe that the last half of my story isn’t convincing. I know where I want to end, and I believe that I’ve told a good story to about half way along the road, but I’m really not sure that the last few miles are ones I can write as well about as the first. Any ideas? Should I work on different endings to see if I get a breakthrough? Should I carry on regardless and edit like a devil once I’ve got some meat on the bone? Does it mean that my main characters are flawed in some way I can’t determine? Is the first part of my story misdirected in some way? Randy sez: First of all, congratulations on getting through the first draft! That’s a major milestone in writing a novel. I’m delighted to hear that my pesky Snowflake method played a role in your getting there. I hear from writers all the time who’ve found it helpful, and that makes me incredibly happy. Finish this second draft you’re on. Sure, you feel a little wobbly about it right now. That’s common. It might possibly even be normal. If you’ve ever run a race over a mile distance (or 1600 meters), the third lap can be pretty rough, and that’s about where you are right now in your race to finish this book. Get a second opinion from somebody you trust. Maybe a skilled writer in your critique group who has shown herself trustworthy in the past. Maybe a good freelance editor. But you need somebody to read the whole manuscript and give you an objective viewpoint. (“Objective” here means “somebody who isn’t you.”) You may need to pay something for this, but very good friends often do it for free. Read that opinion, and then read through the whole manuscript as fast as you can, making a few quick notes on what you see, now that your eyes have been opened by a second opinion. Once you’ve done all of the above (yes, it’s a lot of work, but professional writers work really hard), make the decision. Do you go on with the project? Do you walk away from it? Either decision can be valid. If the story is fundamentally flawed and can’t be fixed, then walk away. If you’ve just lost all taste for the story and you can’t stomach working on it for one more second, then walk away. But if you see renewed hope for a way to make the story work, well then. It might take you a month or two to get there, but when you do, email me privately on my Contact page to let me know how it turned out. I’ll be interested to hear what you learned and which way you decided to go. What’s the right way to edit your novel? Or … is there a right way? I am an amateur writer, and have no idea when to begin revisions. Should I start revising the first part of my writing part way through, or begin revision once I am finished with the whole work? Randy sez: This is a good question, and there’s no one right answer that works for everybody. Each of these is perfectly valid, and there are best-selling novelists and award-winning novelists who use each of them. Depending on how your brain is wired, you’ll work best with one particular Creative Paradigm. Different writers use different Editing Paradigms also. I haven’t put much time into polling writers to find out their Editing Paradigms, but it wouldn’t surprise me to learn they’re as varied as the Creative Paradigms. The “Edit As You Go” Creative Paradigm actually mixes in Creation and Editing very tightly. The author writes a bit (a page or a scene) and then edits it immediately. Sometimes this unit gets edited many times before the writer is ready to go on. But once the page is done, it’s pretty close to being final. Dean Koontz writes this way, and so do many other writers. The important point is that whatever works for you is whatever works. 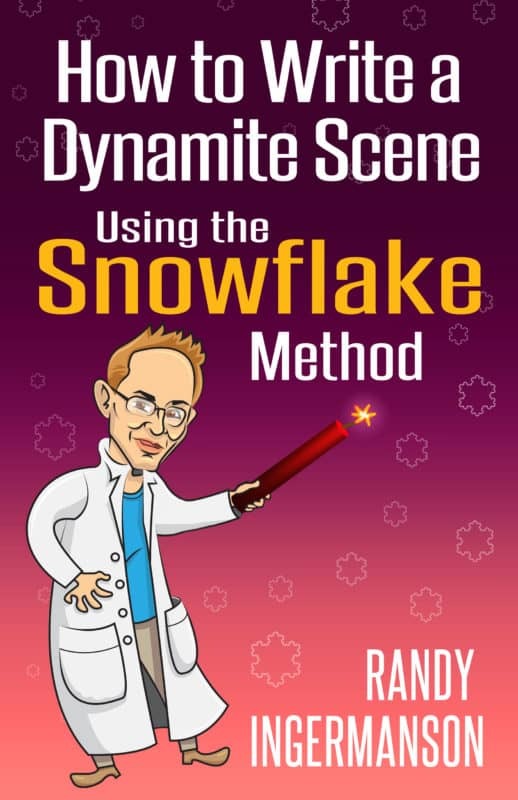 I plan my novels in advance, working through my Snowflake method to create a Snowflake document that spells out at a high level how the story is going to go. Then I write the first draft (usually quite quickly) using my Snowflake document as a guide. As I complete each quarter of the book, I revise the Snowflake document to be up to speed with the changing story. (A story is not fixed in stone, and neither is a Snowflake document). During the first-drafting period, every day I do a quick ten-minute edit of the previous day’s work. (Usually, this is 2000 to 3000 words.) I fix any spelling and grammar errors and I tweak the wording. If there are obvious problems in the storyline, I fix them. That’s not common, because Snowflaking tends to produce stories that don’t have major structural problems. Having done a ten-minute edit of yesterday’s work, I’m then primed to start work on the next chapter. I drill that out without doing any editing, and if I have time, I write another scene, up to my daily word-count. This keeps me moving forward, and I never feel like I’m getting bogged down in a morass of words. I organize my writing into folders. I have a main folder named “Books Written”. Within that folder, I have a folder for each book, named with the original working title of the book. Within each book folder, I have a number of organizational folders for Proposals, Research, Marketing, etc. The first draft goes into a folder named “Draft 1”. When I’ve finished the first draft and am ready to start editing, I duplicate the entire “Draft 1” folder and name the copy “Draft 2”. Then I never change anything in “Draft 1” again. I work in “Draft 2” until I’ve done a complete revision. I generally do 5 or 6 drafts, and for each of these, there’s a separate folder. When I look at the files, they’re ordered nicely and it’s easy to see what’s the current draft. It’s the highest numbered “Draft” folder. As I mentioned, I’ve never tried to figure out what Editing Paradigms other writers use, but this might be a good time to do it. So authors, please leave a comment and describe your Editing Paradigm! There’s no prize here, other than the massive fame you’ll get by leaving a comment on the Advanced Fiction Writing Blog. And what more could you want than that? How do you go about editing your self-published novel? Are there some steps you can take to make sure your fiction is ready to go before you push the button to upload to the online retailers? I saw your blog about knowing when your book is finished, and you seemed to gear your response towards those who are seeking to be published via the traditional route. But for those of us that are considering the self-pub route, how would you recommend we decide when our book is finished and ready for publishing? Today it can make all kinds of financial sense to self-publish a novel in e-book format, with one caveat. A self-published novel should be just as well-written and well-edited as a traditionally-published novel. You need a second opinion from a qualified editor. I need to expand on this, because there are at least four major steps in editing a novel: the “macro edit”, the copy edit, the line-edit, and the proofreading. There’s one task no author is qualified to do. You can’t objectively do a “macro edit” on your own work. You’re too close to it. You are always going to see your novel subjectively. You need a qualified editor to read your novel and tell you whether the story is working–the concept, the story structure, the characters, the theme, the voice. Pay a professional freelance editor to do a macro edit and produce an analysis of the story. Revise the manuscript, either following the advice of my editor or (on careful consideration) rejecting that advice. Copy edit, line-edit, and proofread the novel. Hire a graphic designer to do the cover art. Upload to the online retailers–Amazon, B&N, Smashwords, and the Apple store. Smashwords is also a distributor and they take care of getting my work into other online retailers, such as Kobo, Diesel, etc. Note that Smashwords does its own e-book conversion direct from Microsoft Word format, which is handy and can produce quite good results but you have to create the Table of Contents manually, which is a hassle. Most of these steps are obvious ones that anybody would take, with the exception of Step 2. Amateurs don’t get their work macro edited. Professionals do. And where do you get this magical macro editor? You may get good results by having a writer friend do your macro edits. Some writers are brilliant analysts and can produce an excellent report for you, detailing the issues you have in your concept, your structure, your characters, your theme, your voice, and so on. But some writers are terrible at this, so don’t trust your macro edit to just anybody. A good macro editor doesn’t have to be a writer. She doesn’t even have to be a professional in the industry. She just needs to get your writing, know how to tell you what’s right with your fiction, and know how to tell you what’s wrong. Each of those points is important. Your editor must get your writing. I once had a professional editor at a major publisher who didn’t get my novel. He hated it, in fact. Thought it was drivel. (Another editor at that same publisher thought it was my best stuff ever, and other editors who’ve seen it agree. But this one editor just didn’t like it.) Fortunately, the project crashed and burned and neither I nor the editor had to suffer the injustice of him editing my work. Your editor must know how to tell you what you’re doing right. She is going to give you a report detailing all the things wrong with your novel. If she doesn’t also point out the many things right with it, then she’s going to crush your ego and possibly kill your novel. Don’t let this happen. Make it clear that you desperately need to know what’s good in your work. Your editor must know how to explain what’s wrong. She needs to be sensitive here, but firm. She does not need to know how to fix the problem. Fixing your fiction is your job. Pointing out what needs to be fixed is your editor’s problem. She may point out that your craft simply isn’t at a publishable level yet. If so, then get a third opinion to confirm that. If your craft really isn’t there yet, then go get some more training (that’s what this web site is for) and then rewrite your novel and have your macro editor look at it again. Every writer is different. Every editor is different. When you find an editor who gets your work and who can distinguish the good from the bad in your work, hang on to her forever, because she’ll be gold for you. If an editor fails in any of these areas, never use her again. She may be great for somebody else, but if she’s not right for you, then that’s a showstopper. A macro edit will generally cost you. If you’re very lucky, you might have a friend who will do it for free. Typically, it’s going to cost hundreds of dollars and sometimes as much as a few thousand dollars for a high-end professional editor. You don’t always get what you pay for, so be wary here. I don’t do macro edits myself, so please nobody ask me for my rates. When I need macro editing, I work with Meredith Efken at FictionFixitShop.com. She gets what I’m trying to do with my fiction and she knows how to tell me what’s good and what’s bad. She may or may not be the right editor for you, but there are plenty of other fish in the sea. As I noted above, after you make revisions in response to the report of your macro editor, you still need to copy edit, line-edit, and proofread your work. These are mechanical tasks that you can do yourself or hire out. It’s up to you. When those tasks are done, you’re ready for cover art, file conversion, and uploading. Don’t try to make it too complicated by spending forever on the editing. Don’t try to make it too simple by skipping the macro edit stage.